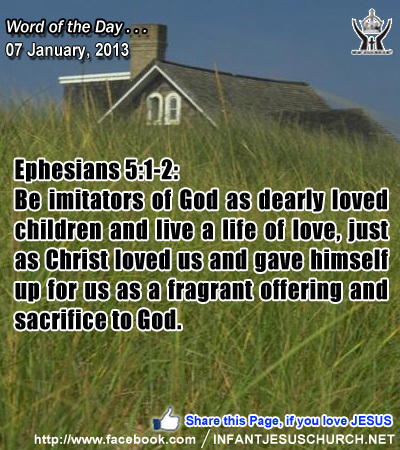 Ephesians 5:1-2: Be imitators of God as dearly loved children and live a life of love, just as Christ loved us and gave himself up for us as a fragrant offering and sacrifice to God. Heavenly Father, we will never fully understand how you could love us so much that you would allow your son to die for us, as my sacrifice. Please help us love others sacrificially. We know the power to do this is not within us, so please pour your love into our heart so that we may share that love with others. Through Infant Jesus, we pray. Amen. 12Now when he heard that John had been arrested, he withdrew into Galilee; 13and leaving Nazareth he went and dwelt in Caper'na-um by the sea, in the territory of Zeb'ulun and Naph'tali, 14that what was spoken by the prophet Isaiah might be fulfilled: 15 "The land of Zeb'ulun and the land of Naph'tali, toward the sea, across the Jordan, Galilee of the Gentiles 16the people who sat in darkness have seen a great light, and for those who sat in the region and shadow of death light has dawned." 17From that time Jesus began to preach, saying, "Repent, for the kingdom of heaven is at hand." 23And he went about all Galilee, teaching in their synagogues and preaching the gospel of the kingdom and healing every disease and every infirmity among the people. 24So his fame spread throughout all Syria, and they brought him all the sick, those afflicted with various diseases and pains, demoniacs, epileptics, and paralytics, and he healed them. 25And great crowds followed him from Galilee and the Decap'olis and Jerusalem and Judea and from beyond the Jordan.. Announcing the good news, Jesus made two demands: repent and believe! contrition requires a life-change and a conversion of heart and mind. The Holy Spirit gives us a repentant heart, a true sorrow and detestation for sin and its consequences, and a firm decision to avoid it in the future. The Holy Spirit gives us grace to distinguish our sin for what it is - revolt and a rejection of the love of God. God’s grace helps us to turn from all that would keep us from his love. Faith or belief is an entirely free reward which God makes to us. Believing is only possible by grace and the help of the Holy Spirit who moves the heart and changes it to God. The Holy Spirit opens the eyes of the mind and makes it simple for us to accept and believe the truth. To believe is to take Jesus at his word, to believe that God loved us so much that he sent his only beloved Son to save us from the slavery of sin and death. God made the supreme forgo of his Son on the cross to carry us back to himself. Do we know the love of God that surpasses all else and that impels us to give him our all? God wants to change our way of thinking and change our lives by the power of his word. Loving Infant Jesus, your ways are life and light! Let your word penetrate our heart and transform our mind that we may see your power and glory. Help us to choose your ways and to do what is pleasing to you.